One of the benefits of now having a STC-1000 temperature controller hooked up to my spare fridge is that I can now ferment at any given temperature as I see fit. 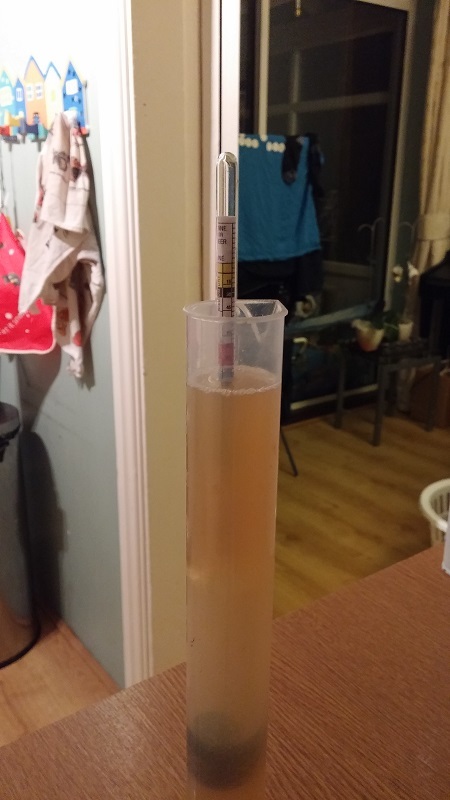 For the most part this will just allow for consistent fermentation for my ales however it does also mean I can now brew a Lager and ferment it at the optimum temperature for the yeast of 12C. As a result of the cooler fermentation temperatures Lagers need to have significantly more yeast cells pitched than an ale and as just opening the packet and pitching it in wasn’t going to cut it, a yeast starter would be required. This was started two days before brewday and placed on the Stirplate to stimulate the yeast growth from c. 96 billion up to around 175 billion cells. Beersmith suggested I would be better using a 2l starter at nearer to 250 billion cells however as I only have a 1l Erlenmeyer flask it would have to do! This time I am aiming for 4.8% ABV and a clean light bodied lager. Although there are 150g of Hops in the recipe the Alpha Acid (AA) of them is only 3.07% so the end result won’t be too bitter! The brewday went impressively smoothly, and despite being freezing in the brewery today all target numbers were hit and we ended up with 23l of 1.046 Lager in the fermenter. The yeast was pitched and into the fridge it went! 12C for 14 days to ferment and then two months lagering at 5C.